If you are lucky enough to have a Steak 'n Shake nearby, you may have tried their delicious Frisco Melt. They are addicting and delicious. If the craving strikes you and you'd like to feed your family for much cheaper than ordering these from the store, try my adapted recipe for Frisco Melts. I love them. Notes: As a few comments pointed out, Frisco Melts don't always have onions on them. This varies from location to location. I love caramelized onions so I always add them. While two patties per sandwich are delicious, for most appetites it is a lot of food. I only use one patty per sandwich. It stretches the meal a little longer anyhow. If you do this, when you add the cheese in step 2, add both slices of cheese to one patty. Also, in a pinch I have used only Russian dressing for the frisco sauce. If I had to choose either Thousand Island or Russian, I'd recommend the Russian dressing. Note: The recipe yield will vary depending on how many burger patties you use per sandwich as well as how thick they are. If you haven't already prepared the caramelized onions, do so first and set aside. Prepare the Frisco sauce and store in the fridge until ready to use. Saw this on pinterest and had to come over and follow you! Made these for dinner last month & they were a HUGE hit!! So so good!! Thanks for sharing! Because it was updated by the author after comments pointed it out. Pay attention to dates. You commented almost 5 years later. As a former Steak N Shake employee who actually made the Frisco sauce, I can tell you it is four parts 1000 Island dressing and three parts French dressing. So for a small batch of dressing you could use four Tbsp 1000 Island and three Tbsp French. This was really good. I did make it with ketchup and thousand island dressing and a second batch with russian dressing and thousand island dressing...both were comparable...didn't taste too different. Either way my boyfriend really enjoyed it and wanted me to make him another! definitely a keeper! onions were a nice touch. very good. Drool worthy. A must for my weekend menu! Can't wait to try these. We are going to Steak and Shake tonight. It's a 40 mile drive one way so you can tell we love the place. We prefer this rather than going out for a nice steak sometimes. we dont have a steak and shake where i live but i thought i would try this recipe anyway (cause it looked delicious) my family and i love them. the recipe was easy to follow and the flavors were great. i will definitely make them again!! As I was commenting on the biscuits and gravy I saw this recipe - oh MY!! 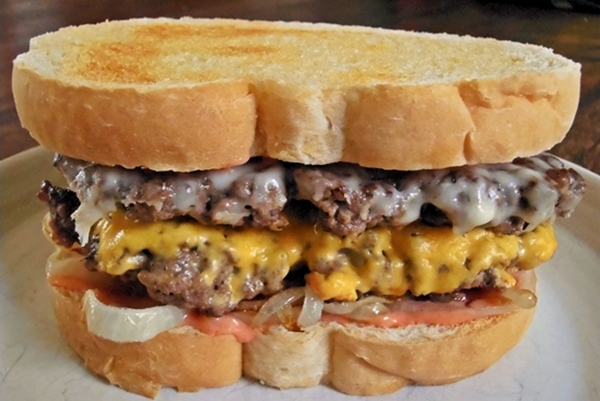 I love - what we call a patty melt - this burger! We have a steak and shake but who cares? Yours looks WAY better and I can't wait to make it! This recipe is seriously the bomb!! My husband and I just love Steak n Shake! I just started my own food blog and featured it tonight :) So thank you so much for sharing in the yummyness. There are no onions on a frisco melt! It's just buttered sourdough, american and swiss cheese, and frisco (1000 island) sauce. We haven't had grilled onions on our frisco since I've worked there (about two years now). For all of you that commented that sns doesn't use onions please read the post again as it was said that it was a preference. Just sayin! Following in the footsteps of five of my sisters (one whose name was also Debbie :)), I too worked at Steak N Shake and it was for 2 years (in IL). I actually held the special title as the Master of the Grill for my district. To be fair, it's been twenty years and their recipes may have changed since then, but I doubt it. I've heard people use all sorts of crazy things in their recipes to mimic the Frisco sauce. They did not use Russian dressing (or ketchup as some suppose). They used Thousand Island and French dressings measured in equal parts. 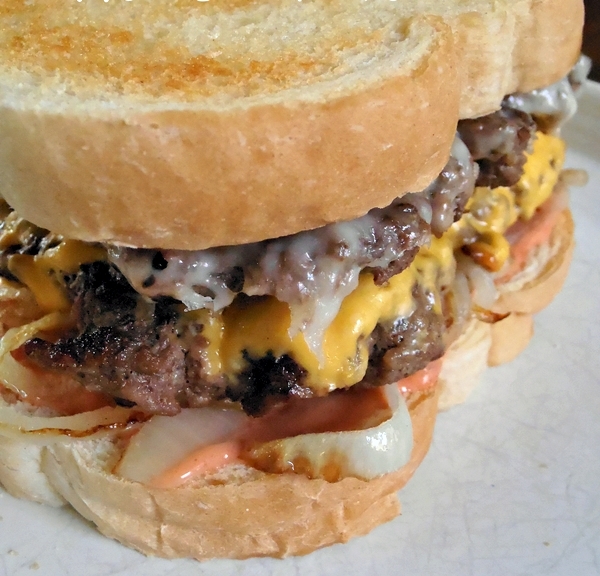 The grilled (or caramelized) onion was on the Patty melt which was on Rye bread with American cheese, but not the Frisco (unless specially requested, as Debe clarifies above). The Frisco Melt recipe calls for two fresh slices of tomato. We also grilled our bread rather than toasting it. That makes a big big difference in the taste experience. If you want to get technical, we would butter it with real butter, melted in a roller. Just in case you were wondering, we did not butter the buns that were toasted on the grill to use for steak burgers. Hope this helps everyone! We would also put the slice of Swiss on one of the sourdough slices, probably because it was too big for the steak-burger patty. The American would go on the bottom patty. The SNS Frisco definitely stands apart from all other burgers. Isn't there also parmesan cheese grilled to the top and bottom of the bread or is that just what I remember? If I am correct, then how do I go about doing that? Using butter on the slices or something else? I am making these tonight, looks good. Sauce and onion seem to differ between franchises. Not if it is available everywhere but here in Michigan at our local Kroger store we can buy a bottle of Steak n Shake frisco sauce. The nearest Steak n Shake is 750 miles away! I will definitely be trying this. Thanks for posting!